The finding of a near complete porcelain bowl, an example of Chinese export ware, on the site of the Family Court in Parramatta during archaeological excavations in 1985 was the first time Chinese porcelain had been reported from an early colonial context in New South Wales. It was found amid the footings of a government hut, erected in the 1790s. It is physical evidence for the trade between Canton, Madras and Sydney, commenced as early as 1792 by members of the Rum Corps, but later taken over by the Sydney merchants. Since 1985, Chinese porcelain (Canton or Nanking wares) has been found on a large number of sites in both Sydney and Parramatta. The wares were imported for only a brief period. They are generally dated from the 1790s to the 1810s, though a few pieces were found at Port Macquarie on the Glasshouse excavations in 2006, in contexts dated to the 1820s. Chinese porcelain of this type is thus a very good indicator of early settlement, rarely found outside the initial settlements of Sydney and Parramatta. When a few fragments were found in the remains of a slab hut at Belgenny Farm, Camden, they helped confirm the identification of the "small miserable hut", so described by Governor Macquarie on a visit in November 1810. 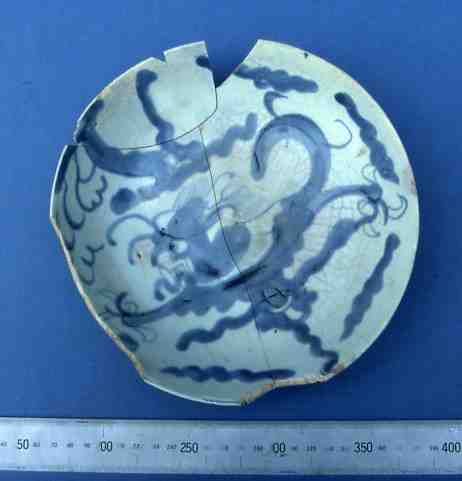 It is highly appropriate that this Chinese porcelain has been found on a site owned by John Macarthur, since he was one of the first people to be involved in the Chinese trade. See Belgenny Farm. Edward Higginbotham. 1987. "The excavation of buildings in the early township of Parramatta, New South Wales, 1790-1820s", Australian Journal of Historical Archaeology, vol. 5, 3-20. D. R. Hainsworth. The Sydney Traders. Simeon Lord and his contemporaries, 1788-1821. Melbourne University Press. 1981. James Broadbent, Suzanne Rickard & Margaret Steven. India, China, Australia. Trade and Society, 1788-1850. Historic Houses Trust of New South Wales. 2003. Chinese export ware. Porcelain bowl, with blue underglaze, late Ming (1368-1644), but imported into New South Wales between 1792 and the 1820s. This piece is now on display in the Museum of Sydney on the site of First Government House.